Oncorhynchus mykiss is called steelhead or rainbow trout depending on its lifecycle and environment. Steelhead is the anadromous (sea-going) race, while the rainbow trout never leaves freshwater. While the two are very similar and both vary with habitat and life stage, steelhead tend to be less colourful, slimmer, and grows larger. Before spawning both are brighter and more silvery; during spawning the body colour becomes darker, duller, and more olive-brown (particularly on the sides and back). On rainbow trout there is a wide pink to red stripe along each side of the body (lateral line); upon spawning this colouring intensifies. In contrast, with steelhead this pinkish-red colour first appears during spawning. In all cases the back and upper sides of the body are heavily speckled. Steelhead reach 122 cm long and can weigh more than 20 kg; rainbow trout reach 90 cm long and 9 kg. In winter deep, slow-moving streams are important freshwater habitat for this species, and spawning occurs in gravelly, relatively silt-free streams. Rainbow trout, which remain in freshwater their whole lives, inhabit lakes, rivers, creeks, tributaries, and streams. Juvenile steelhead migrate to open ocean after spending a variable amount (up to 7 years, though usually only a few) in streams and rivers. They remain at sea for up to 3 years; some populations migrate to sea for one season, return for a winter without spawning, and then head back to sea. Some steelhead return to freshwater between May and October to become sexually mature before spawning; these fish take months to mature. Others mature in the ocean, and return to freshwater to spawn between November and April. Steelhead and rainbow trout are found in freshwater throughout much of coastal and interior British Columbia west of the Rocky Mountains; they are also found south to California, north to Alaska, and west to the Kamchatka Peninsula. At sea North American populations migrate north along the coast of Alaska and the Aleutian Islands. This species has been introduced throughout the world, giving it a global distribution; where introduced it may have negative ecological impacts. ​The cutthroat trout (Oncorhynchus clarkii clarkii) is more extensively speckled, has a longer head, and has a red or orange streak under its lower jaw. Click here for a comparison of the heads of these two species. Steelhead and rainbow trout are highly valued by sport fishermen and are caught incidentally by commercial fisheries in pursuit of Pacific salmon. The species is also commercially farmed in North America and globally. 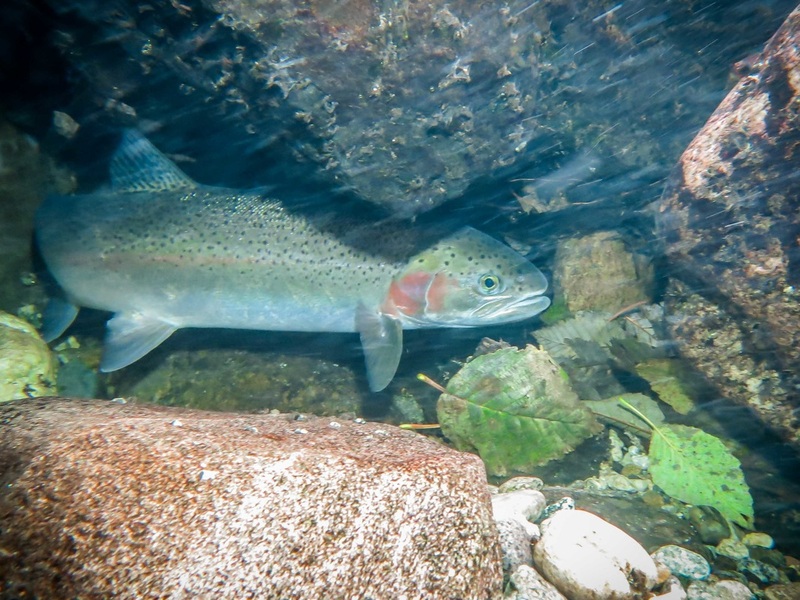 Unlike Pacific salmon (coho, chinook, chum, pink, and sockeye), steelhead do not always die after spawning; they can migrate to the ocean and back to spawn once or even twice more in their lifetimes. Those that spawn repeatedly are called "kelts". Despite having "trout" in the name of both the anadromous and the freshwater variant, this species is more closely related to Pacific salmon than trout. Click here for more information on rainbow trout; click here for more information on steelhead. Government of Canada. (2013). Do You Know: Steelhead? Salmon Facts. Fisheries and Oceans Canada. Accessed 07/03/2016. Lamb, A. and Edgell, P. Coastal Fishes of the Pacific Northwest. Revised. (2010). Madeira Park, BC: Harbour Publishing. P. 66-67. Luna, S. M. and Valdestamon, R. R. Oncorhynchus mykiss (Walbaum, 1792) Rainbow trout. FishBase. Accessed 07/03/2016. McPhail, D. Oncorhynchus mykiss (Walbaum, 1792). In Klinkenberg, Brian. (Ed.) 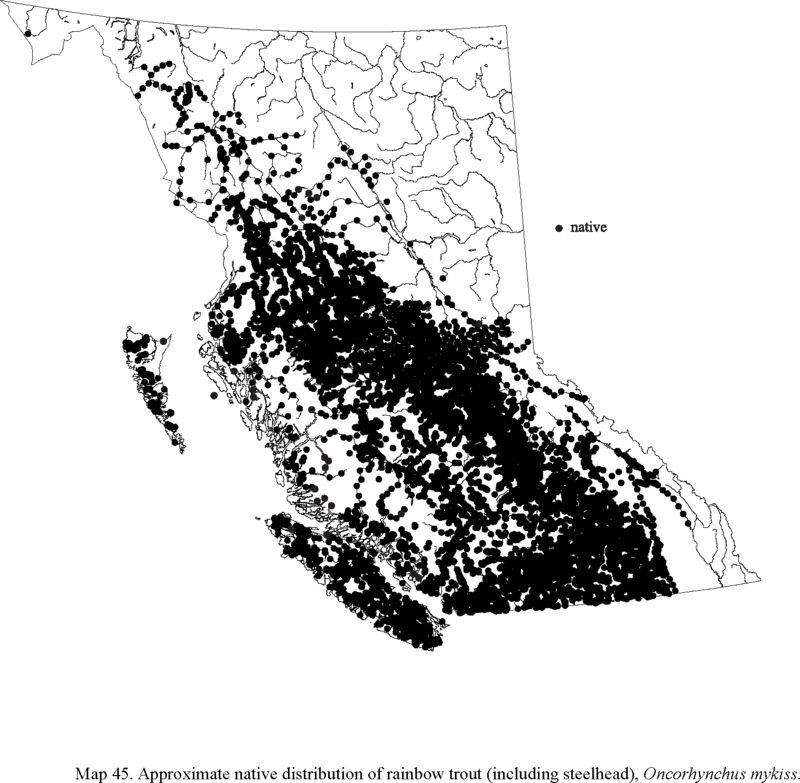 E-Fauna BC: Electronic Atlas of the Fauna of British Columbia. Lab for Advanced Spatial Analysis, Department of Geography, University of British Columbia, Vancouver. Accessed 07/03/2016. NOAA Fisheries. (2016). Steelhead Trout (Oncorhynchus mykiss). Accessed 07/03/2016. Province of British Columbia. ​​Rainbow Trout Oncorhynchus mykiss. B.C. Fish facts. British Columbia Ministry of Environment. Accessed 07/03/2016. Province of British Columbia. ​​Steelhead Trout Oncorhynchus mykiss. B.C. Fish facts. British Columbia Ministry of Environment. Accessed 07/03/2016.